Monochromatic painting has been an important component of avant-garde visual art throughout the 20th century and into the 21st century. Painters have created the exploration of one color, the examination of values changing across a surface, the expressivity of texture and nuance, expressing a wide variety of emotions, intentions and meanings in a wide variety of ways and means. From geometric precision to expressionism, the monochrome has proved to be a durable idiom in contemporary art. The very first to use the practice as a satirical statement was French caricaturist Bertall, with his plate Vue de La Hougue (effet de nuit), par M. Jean-Louis Petit (1843). 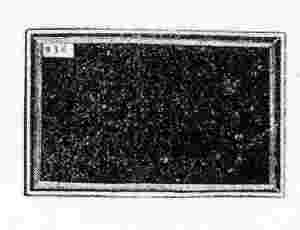 It consisted of a black painting filled with white dots and was printed in L'Illustration. The practice was picked up more systematically by the Incoherents, a small art movement in late 19th century France, who transformed it from a whimsical pastime to an artistic statement. On the Incoherents first exhibition in the home of Jules Lévy on October 1, 1882, an all-black painting by poet Paul Bilhaud called Negroes Fighting in a Cellar at Night was exhibited. Bilhaud's painting was appropriated by Alphonse Allais who produced an album of seven monochrome prints, entitled Album primo-avrilesque. This kind of whimsical and absurdist activity resurfaced again 20th century Dada and particularly the works of the Fluxus group of the 1960s, than to 20th century monochrome painting of Malevich and Yves Klein. The very broad range of possibility (or impossibility) in interpretation of the monochrome in painting is arguably why monochrome painting is so engaging to so many artists, critics, and writers. Although monochrome has never become dominant and few artists have committed themselves exclusively to it, it has never gone away. It reappears as though a spectre haunting high modernism, or as a symbol of it, appearing during times of aesthetic and sociopolitical upheavals. Monochrome painting as it is usually understood today began in Moscow, with Suprematist Composition: White on White of 1918 by Suprematist artist Kazimir Malevich. 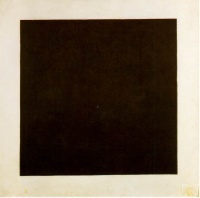 This was a variation on or sequel to his 1913 work “Black Square on a White Field”, a very important work in its own right to 20th century geometric abstraction. In 1921, Constructivist artist Alexandr Rodchenko exhibited three paintings together, each a monochrome of one of the three primary colours. He intended this work to represent The Death of Painting. While Rodchenko intended his monochrome to be a dismantling of the typical assumptions of painting, Malevich saw his work as a concentration on them, a kind of meditation on art’s essence (“pure feeling”). These two approaches articulated very early on in its history this kind of work’s almost paradoxical dynamic: that one can read a monochrome either as a flat surface (material entity or “painting as object”) which represents nothing but itself, and therefore representing an ending in the evolution of illusionism in painting (i.e. Rodchenko); or as a depiction of multidimensional (infinite) space, a fulfillment of illusionistic painting, representing a new evolution—a new beginning—in Western painting’s history (Malevich). Additionally, many have pointed out that it may be difficult to deduce the artist’s intentions from the painting itself, without referring to the artist’s comment. Unless indicated otherwise, the text in this article is either based on Wikipedia article "Monochrome painting" or another language Wikipedia page thereof used under the terms of the GNU Free Documentation License; or on original research by Jahsonic and friends. See Art and Popular Culture's copyright notice. This page was last modified 10:18, 6 September 2017.